Ngarkat (pronounced Narrkat) – what can I say, except another beautiful spot. More Mallees perhaps, very sandy, a great walk, taking us to a high spot, where you could see all the crops of a neighbouring farm and the overview of the rest of the park. A new pit toilet, water tank, old shed, occupied years ago by shepherds as an outstation, but the very interesting part, for us, was meeting the Ranger. A friendly young woman, who is one of two Rangers who manage the 270,000 hectare National Park. She was in the park to give a talk to a group of year 12 students. She had found a dead brown snake on the road on the way in, so thought she’d wake the kids up a bit by surprising them with this strategically placed snake. We heard the screams, followed by laughter, from the group and guessed her practical joke was well received. We had a chance to speak to her afterwards and she retrieved the snake from where she’d thrown it into the bush and we both touched it and the scales were quite beautiful. She opened its mouth, showed us its fangs, which were very small, and we were surprised to see that it also had a mouthful of tiny teeth. The Ranger said that if you wear thick socks, jeans and boots, it would be unusual for you to get bitten, as most of the venom is injected on the second bite! They save the first lot of venom for feeding on their more customary prey. 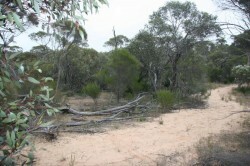 Karte is another Mallee park about 80 Km north west of Ngarkat, but is far less visited, as shown by the amount of firewood around. A brand new pit toilet and sectioned off areas for campers, with the occasional table here and there. We had orchids on our mind and set of on a walk through the sand (on a designated walk) and found our first orchid. It’s a Spider Orchid – not sure of its proper name. 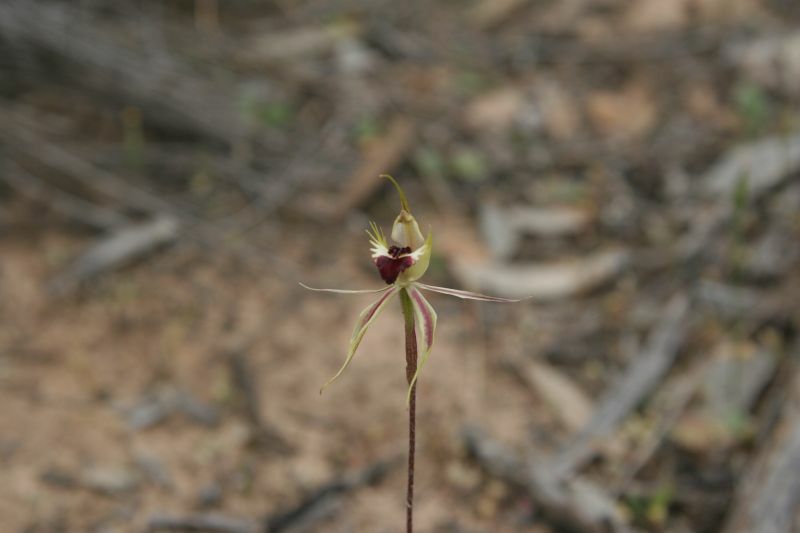 This orchid was found in the harshest of growing conditions. Sand, wood, bark everywhere and full sun. We stayed at Karte for 3 days and loved it. We took the same walk on the second day and found a green spider orchid, but it was under the log, seen above, and the photo didn’t reflect its beauty. Russ has to almost lie on the ground to photograph these 150cm orchids. The third day we walked the other end of the track, where we saw grevillias, lovely grasses, correas, mallee tea trees, just to name a few. We are presently in Burra, where we have reception, enabling me to write this blog. I’ll leave Burra for another day, as my shoulders are aching.